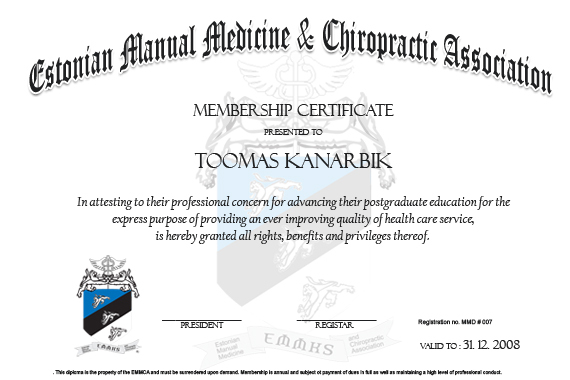 Mission: EMMCAs mission is to preserve, protect, improve and promote the manual medicine, manual therapy and chiropractic professions and the services of doctors and therapists which practice in manual medicine. Patients rights are also protected by the implementation of regulations governing the standards and ethics of these health-care professionals in Estonia. The purpose of the EMMCA is to provide leadership in manual health care and a positive vision for these health care professions and its natural approach to health and wellness. On behalf of the chiropractic, osteopathic and massage therapy professions, we accomplish our mission and purpose by affecting public policy and legislation, by promoting high standards in professional ethics and quality of treatment and by carrying out a dynamic strategic plan to help ensure professional growth. Members are also kept abreast of local and international developments in the manual medicine fields through newsletter and email commnication. From an educational perspective, EMMCA also holds educational seminars and conference symposiums for its members. On behalf of the public and in order to protect them from unqualified or inappropriate practices, our vision includes calling together an Examining Board division which accomplishes our mission and purpose by regulating the standards and ethics of these manual medicine professions. EMMCA also organizes domestic and international exibitions and trade-shows for the public and for its members which relate to the natural and manual medicine fields.